This experience wholeheartedly confirmed my desire to pursue research in immunology. Being able to do it in Australia, at a top-tier research university, contributed all the more to my appreciation of the subject. Julie Martinez is a junior, double-majoring in english and biology with a minor in chemistry. 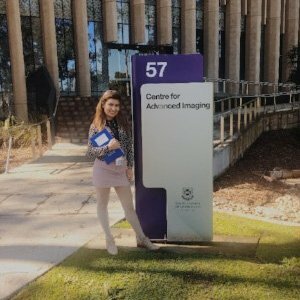 In collaboration with faculty mentor Dr. Chad Barber, and supported by a STEM Summer Study Abroad fellowship, Martinez was able to participate in a summer research program in Australia. She seeks to pursue graduate studies immediately upon completion of her undergraduate studies, hoping to enter a masters program in immunology and microbiology, further seeking to enter an MD - PhD program in molecular biology. She ultimately aspires to become a doctor specializing and working in clinical research surrounding immunology.